Hundreds of people in Norwich turned out to protest President Donald Trump‘s temporary immoral executive order banning Muslims from 7 countries (Iran, Iraq, Libya, Somalia, Sudan, Syria, and Yemen) entering the USA. 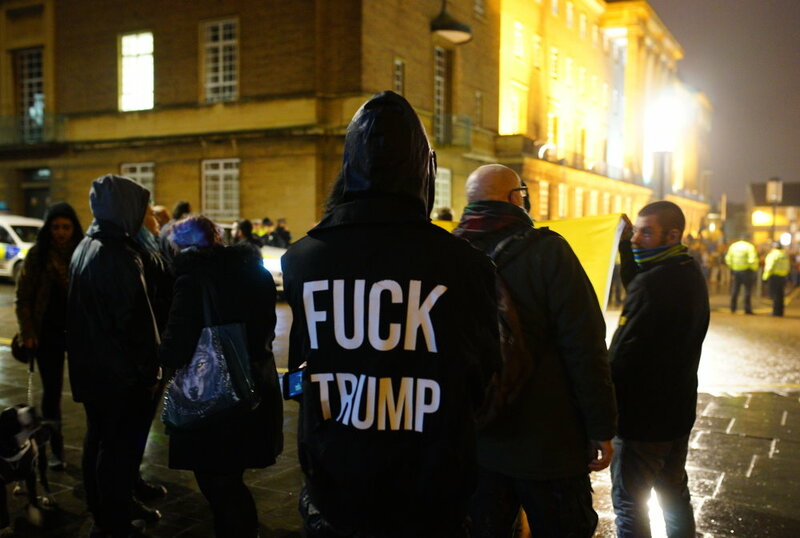 One arrest was made, and the demonstration was otherwise peaceful with a diverse range of speakers and banners from the humorous to the very serious. Perhaps, the best said it simplest, a woman in a headscarf whose placard read “judge me by what is in my head not what is on my head”. Nobody is saying that ISIL’s dangerous ideology shouldn’t be countered, or that terrorists should be denied entry, but to blanket ban seven nations, marking them guilty before a trial, particularly when they are not in the top 25 nationalities that have threatened or attacked US citizens is disproportionate and against the founding charters of America that welcome immigrants, and don’t discriminate based upon religion and race. Nobody is saying that ISIL’s dangerous ideology shouldn’t be countered, or that terrorists should be denied entry, but to blanket ban seven nations, marking them guilty before a trial, based upon nationality and religion alone, particularly when they are not in the top 25 nationalities that have threatened or attacked US citizens is disproportionate and against the founding charters of America that welcome immigrants, and don’t discriminate based upon religion. 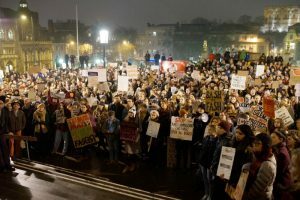 Two protests came together for this event, one organised by UEA student Lotty Clare of Movement for Justice, and the other by Julie Bremner of Stand Up To Racism. 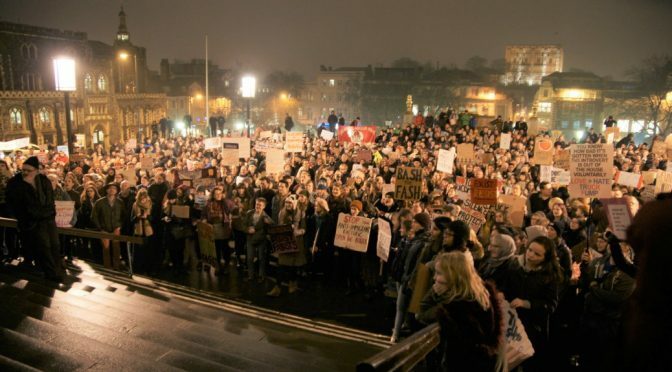 Other groups including Norwich Stop The War Coalition joined in and over 1,100 people signed to attend on a dark drizzly night in February. If anything, it was the hundreds of comments on the EDP online and Mustard TV posts that made me realise why we do this. The spewing of hate and Britain first, echoing Donald Trump’s election manifesto of America first. I talked afterwards to two Donald Trump and Brexit supporters, teenage girls from City College, they had no problem with elitist, nationalist, selfish, protectionist policies, though our debate soon turned to mental health and we had a good conversation. I was interviewed by Robbie West of BBC Look East, Emma Knights of the EDP, and ended up on a Mustard TV live stream. ITV Anglia also reported on the event. 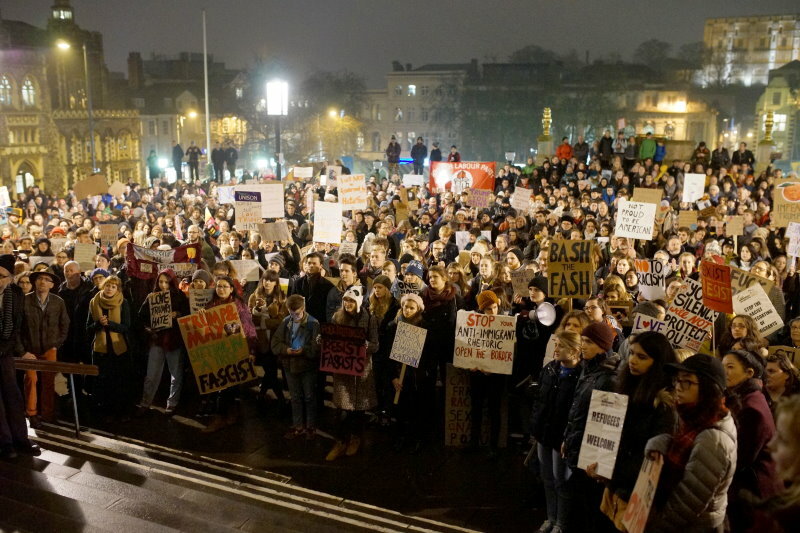 Good coverage and continuing to remind me of how great Norwich is, in the main, and after so many political protests and pro-migrant rallies over the last year it shows the strength of feeling in communities, both pro and anti. The 7 nation Muslim visa and refugee ban was signed on Holocaust Memorial Day, a day when the Whitehouse chose to #alllivesmatter the victim list by not mentioning Jews and homosexuals at all. The fear that LGBT people may have their Obama-won state protections removed has also been concerning people, even if that comes to nothing, people are living in fear and anxious times. America’s biggest terror massacre since 9/11 was by an American, albeit the son of an Afghan immigrant – but not on Trump’s ban list, who traveled back and forth to Saudi Arabia – also not on the list, before killing 49 people, mainly Latinos, in the Orlando Pulse club shooting. No connection to the seven nation ban list. Despite the so-called British exemption, Iranian-born but raised in Italy and doing post-grad veterinary studies at the University of Glasgow, Dr Hamaseh Tayari was denied US-leg travel by the presidential executive order, the extra flights avoiding America cost £2600 however, public response raised more than double that via crowdfunding with the excess going to the Scottish Refugee Council. That is one way we can help. Similar to the folk providing food and funds, and many lawyers offering pro-bono free advice at airports across America. Lawyers are saying that “It’s not lawful to ban immigrants on the basis of nationality” but judges and others unwilling to enforce it are being replaced. 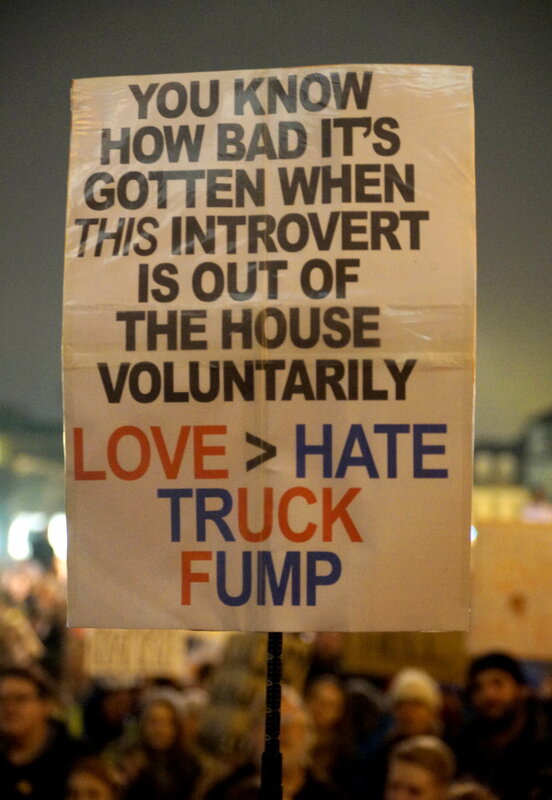 Introvert’s Love greater than Hate, Truck Fump! Indeed, America and its innovations and inventions are built on immigrants, not just the last century or so, but even those that first came to America, those pilgrim fathers and conquering Catholic explorers of different faiths to the established indigenous inhabitants. Indeed 7 nations of foreign religious immigrants from the early Norse to the British, Dutch, French, Spanish, German, Irish and even Russians (Kodiak Island) came to America and populated it, and far from peacefully. Will Donald Trump now block Canadians visiting the US, or won’t it matter if the victims are other Muslims and the aggressors other American continent citizens? 11,000 are killed on US soil each year at the hands of US citizens, black and white, Christian and Muslim. More toddlers than terrorists kill Americans. Ban guns not Muslims. ISIS kills more Muslims than Christians and more people from the seven barred nations than American citizens. How many Americans you ask? The number of Americans killed by terrorists who’ve entered the US as Refugees? ZERO. No person accepted to the United States as a refugee, Syrian or otherwise, has been implicated in a major fatal terrorist attack since the Refugee Act of 1980. Prior to that only Cuban non-Muslims had. Even if we include attacks and plots with no fatalities, then just 20 refugees out of 3 and a quarter million have been convicted over 40 years, that’s just 0.0006%, which is statistically zero anyway. An American is 250 times more likely to be killed or murdered by other means than by a foreign-born terrorist. In a study of country origins of terroristsSaudia Arabia, UAE and Egypt topped the list. Trump’s nations only enter the list at places 25 and lower! If the ban were announced with a one week notice, the “bad” would rush into our country during that week. A lot of bad “dudes” out there! Calls to ban Muslims from entering the U.S. are offensive and unconstitutional. Yes we need to be careful calling this an “all Muslim” ban or saying it came only from Donald Trump, as Obama’s advisors first drew up the list but as amendmends to the pre-existing Visa Waiver Program. The new ban cancels the visa themselves, rather than requiring them. Wherever it started, it’s where it ends that worries me. 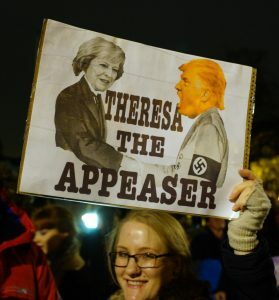 “Theresa The Appeaser” came back from America and Foreign Secretary Boris ‘the joke’ Johnson announced British exceptions to the rules – just like Chamberlain’s futile appeasement attempts in 1938. 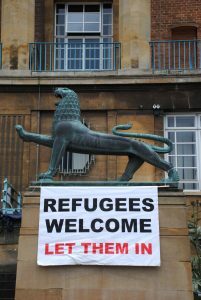 I can appreciate the irony of standing under Hitler’s favourite balcony, Norwich City Hall, protesting. We do need to attack the policies not the person, appreciate the complexities of their origins, and not demonise the man, reference mental health and little hands, that plays into the insecure dictator psyche and adds fuel to Trump supporters that we don’t hear their concerns. Just as with Brexit true communal change can only come about with all parties engaged, remainers and leavers, Democrats and Republicans, Labour, Tory and the rest. We underestimated the fears of leavers and Trump supporters that led to them winning society changing votes that will affect the next 4-5 years or more. I would commend peaceful and polite protest, therefore, but without passive appeasement. The women’s march saw millions gather because it was peaceful. 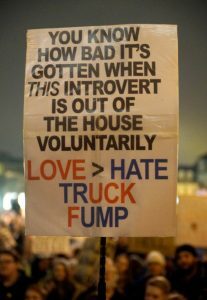 Better to let Trump visit the UK and then have a protest he can witness the size of feeling at. Unrest and civil disobedience are always a later option. 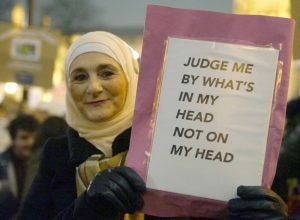 If anything similar were to ever happen here as some Brexit supporters and Nigel Farage have called for, then I’m with Madeleine Albright (a Czech immigrant to the US and former Secretary of State) and would register as a Muslim to demonstrate solidarity, before they list any other categories of people that need rounding up or banning. 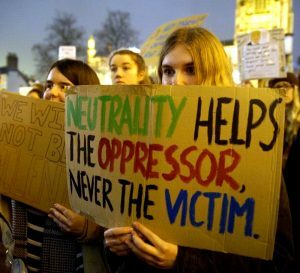 Resist the ban, welcome refugees, and provide practical and legal support where you can, illegal support if it ever comes to it! It’s open mosque day this Sunday – go to one. I am reminded of another of Churchill’s statements that diplomacy does not mean friendship with another state acting immorally towards its people and demonising groups within it. It reinforces the dangerous moral path Theresa May treads in appearing as Donald Trump’s greatest foreign ally. View more photos from the protest here. 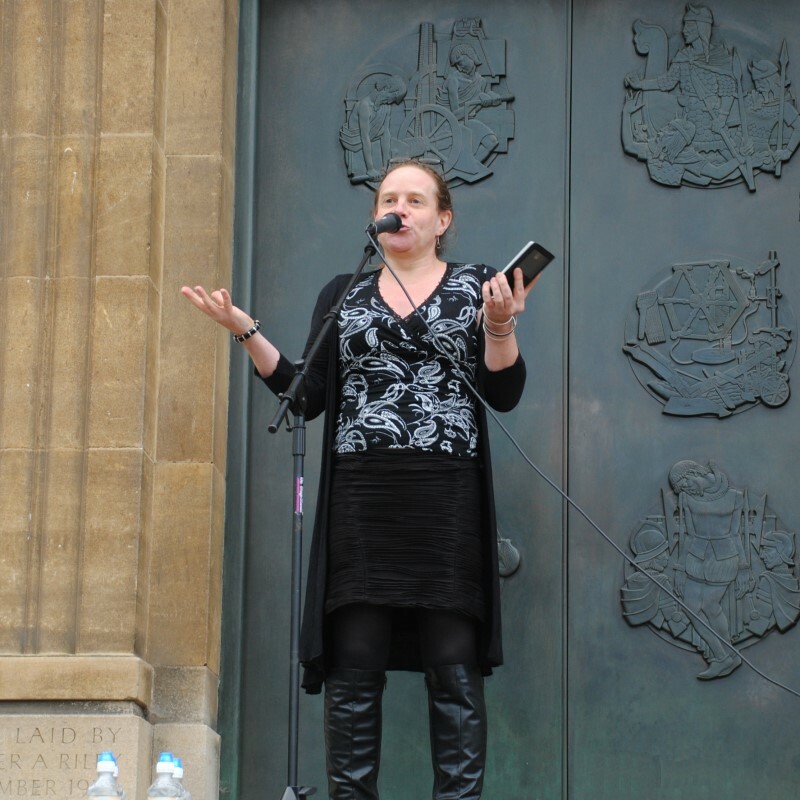 Rebecca Tamás organised a rally of over 400 people on 12 July outside Norwich City Hall, with a dozen speakers across cultures and continents, writers, politicians, faiths, artists, academics and activists, as well as the daughter of the Eastern European village shop on Magdalen St that was arson attacked on 8 July. The purpose of the gathering was to affirm the city’s welcome of migrants, refugees and all its international communities. 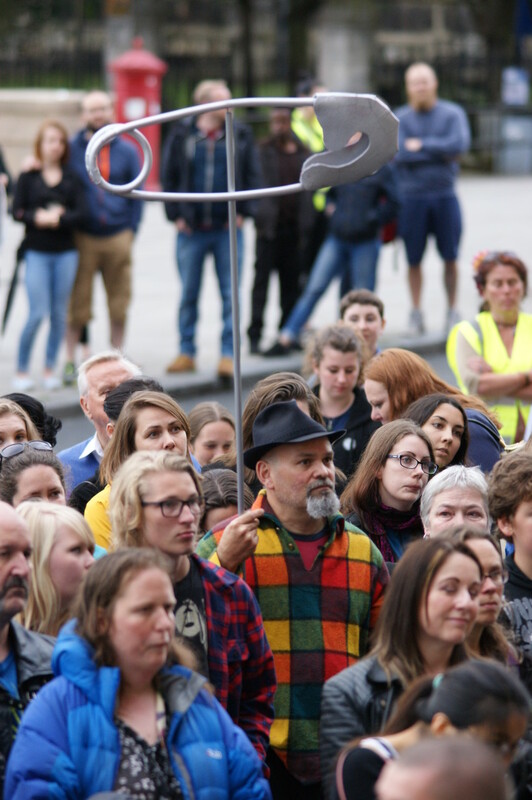 Norwich is a city of refuge and literature to everyone with a story, a safe place for future chapters to unfold, even if there are isolated incidents of hate or racism, Norwich remains a fine city where the community responds to hate with love, to darkness with light. We are all migrants. We are all story-tellers. We are all humans. We deserve the same opportunities, the same love, and the same respect. And, at the end of the day, it really is as simple as that. Hate is taught and caught, not born with, children begin life accepting everyone until we teach them otherwise, it is good for, particularly young people, to be out demonstrating a positive response to diversity and difference, rather than the rise in xenophobia and hate crime witnessed post-Brexit vote. Tim Hughes from Stand up to Racism. An excellent summary of each speaker’s main points can be found on Tony Allen’s blog. 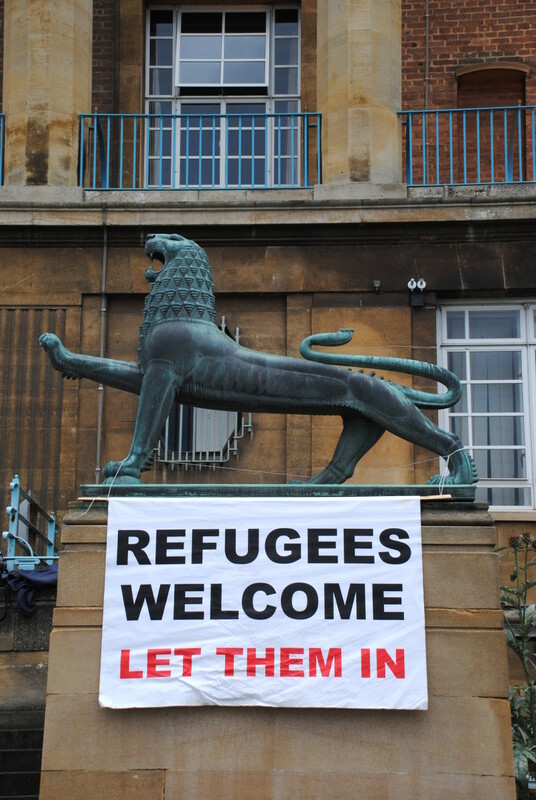 The UK and, indeed, East Anglia have long traditions of immigration. We currently have some 8 million foreign-born people in the UK, about 1-in-8 of us. But, more than that, many of us, if not recent migrants, have Roman, Viking, Norman, Saxon, Dutch, African, Caribbean or Indian ancestors. Ironically, Brexit Boris Johnson has Turkish and Franco-German ancestry and was born in the USA so is included in that 8 million figure! Unless you want to class bombastic British Boris as foreign, the actual number is nearer to 5 million, or about 1-in-12 people. Whatever the figures, though, the important thing to recognise is that we live in a global community, locally expressed. It is community cohesion and communication we need to build to counter fear, hate, and prejudice. My partner is Dutch and my family name has Dutch emigrant roots. In the 16th century Norwich welcomed Dutch and Flemish ‘Strangers’ till they made up a third of our population, bringing new skills that enhanced our then status as England’s second most prosperous and prestigious city. Before that, back in the 12th century, Norwich was 7% Jewish but after the killing of a teenager, posthumously to become St William, that was falsely blamed on the local Jews, and so began the Blood Libel. A persecution and killing of Jews that spread across East Anglia and to Europe, from our fine city of Norwich. By the end of the 13th century all remaining Jews had been expelled from Britain. In addition, slavery, empire, and commonwealth’s, often coerced, contributions to wars, trade, and labour, mean that Britain’s success owes a moral debt to people from around the world. Economically we have, and continue to thrive on, migrant people’s hardworking and entrepreneurial spirit. Economic studies show that immigration is a net benefit, that immigrant people are more likely to be in work or starting their own trades, paying tax, and not claiming benefits, than people of longstanding British heritage. Whether people come to Britain fleeing war, terrorism, homophobia, transphobia, or poverty, they are all fleeing a threat to life, liberty, or livelihood. Even poverty is a slow death and until #Brexit we were the 5th most wealthy economy in the world after Germany which has twice the percentage of migrant background population. We are fully able to sponsor and support asylum seekers, refugees and even so-called economic migrants. What we have to do is engage with British communities that bear the greatest new influxes so that integration is successful. London with over a third foreign national origin people is a successful example after more than 60 years of immigration, Boston and Great Yarmouth, among others, need time to adapt. That means that grants and benefits need to fall upon domestic as well as international communities in those areas. It means increased spending on schools, the NHS, and community services, not austerity which falls hardest upon the poor. Doing this will reduce societal division, fear, hatred, jealousy and suspicion. Hate crimes have surged by 42% in England and Wales since the Brexit result, over 200 a day, the worst rise on record. Three race hate crimes an hour is three too many, especially when nine more per hour go unreported. The UK needs to be at the forefront of offering opportunity and safety to all. Freedom of belief, expression, identity and speech, alongside freedom from poverty, persecution, FGM, homophobia, forced marriage, racism, and torture, these are the very foundations of a truly forward thinking country and culture. Our Home Secretary will become our Prime Minister tomorrow, unopposed. 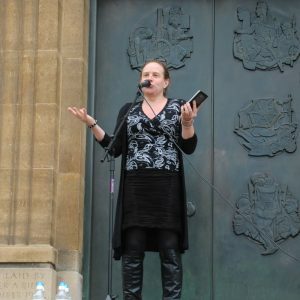 She herself, though, has opposed immigration and despite after much petitioning reviewing asylum seeker processes continues to preside over conditions and interrogations of refugees that demand they prove their sexuality and threats at home in invasive ways. 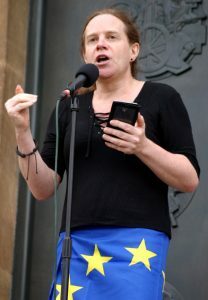 I was one of 8 great speakers at a peaceful anti-Brexit demo, attended by 1500 people, organised by UEA students Emily Cutler and Tom Johnston on the steps of Norwich City Hall, Thursday 7 July. It followed the result of the EU Referendum on 23 June which saw 48% vote Remain but lose in a campaign that was punctuated by fear and fraud, rather than reasoned evidenced debate. It was a democratic process that has highlighted and polarised division in the country over the UK’s relationship with the European Union. But democracy also means that we can keep pressing for change and reconsideration of Brexit, which is a once-in-a-lifetime retrograde decision. For a thoughtful reflection about the event and more on each speaker see Tony Allen’s blog. 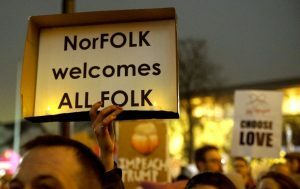 Check out some photos of the event and consider joining the Norwich and Norfolk Stays Facebook group. As the number of speakers grew so inevitably our speeches had to be reduced, so I’ve put below my full-length text, actual text, deletions and ad libs in different colours, so you can compare the planned and final version speech (annoying for many of you, no doubt, but interesting for speech writers!) – if you want a clean actual speech only version click here. I’m a democrat, a liberal, a socialist, and an economist and statistician, and have previously run a business that enjoyed the freedom to trade across the EU. Fifteen years ago I would have voted Leave. A fortnight ago I voted Remain with all my heart, having spent the month before it writing and debating daily for a reformed EU, not a disUnited Kingdom. Let me say from the outset that I believe in hope not hate, unity not division, and am totally opposed to all forms of xenophobia and racism, but and this is where you might not like me so much I’m also against tarnishing all Leavers with the same brush. Whilst the majority of racists it has been said voted Leave, the majority of Leavers are not racists. Nor are they all elderly, nor are they all uneducated, nor are they all unemployed, nor of a different class to some people who may be gathered here. Yes, there are demographics that voted more one way than another, but descending into generalisations and personal attacks without factual qualification is part of the very issue that brought such disrepute to the campaigns of both Leave and Remain. That said, the result of the vote which falls on everybody as much it falls on all voters, as it falls on non-voters, it falls on the media and politicians and everyone who got us where we got two weeks ago which is not the end we can still change that but there have been alike, has been that a majority of people of colour, folk from different countries and cultures, even legally British but ethnically diverse people who have been here for years, my partner is Dutch and has been here 17 years but couldn’t vote. Some of these people now feel less welcome, less safe, and along with a majority of young people under 35, are now worrying about a more insecure future with fewer educational, scientific, cultural and employment opportunities. At the same time though we have to accept that a majority of unemployed or low-paid working class people also lacked hope and voted ‘Out’ because of their own fears about the future, exacerbated by unfounded beliefs that immigration was a threat to them personally or that the alleged benefits of the EU had passed them by and had not been felt or recognised by them. Our failure was in not getting across that message. We need an inclusive internationalism that leaves no communities and no or classes behind. 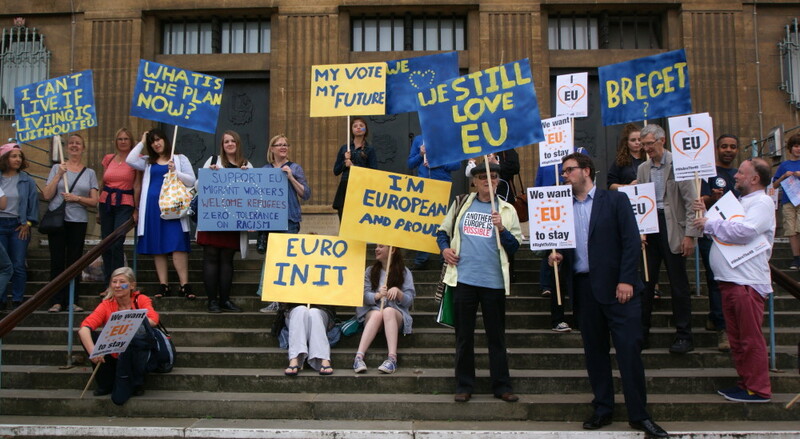 Being part of the 48 per cent, if we shift that to 52 or 54, or 55% we still end up in a divided country if we can’t make that 65, 75 or 95% in favour of staying in Europe, and that means engaging with the 52 per cent, rationally, fairly and humanely. We need to unite against prejudice, against discrimination, xenophobia and hate. I believe that the EU has actually helped that over the years with its motto of “Unity in diversity”, not just of nations and disparate peoples, but also of workers and employers, of women and women, LGBT and other minority communities. The Friday just before the Referendum, it was a Herculean task but they got all 28 nations of the EU to agreed common cause on promoting LGBTI rights across Europe, being part of the EU has helped people like me as a trans person because the EU actually trumped the UK in various courts so that laws were actually, yes, imposed upon the UK by Europe, but they were laws to do with human rights that needed imposing on us! But the EU having these kind of rights to do with human rights and LGBT rights and all the other things, they will actually mean that they can demanded improvement from countries that want to join the EU, from accession countries, countries like Turkey, with its poorer that has an abysmal human rights record. If they want to join the EU then they’re going to have to join the unanimity of the countries that have already promoted human rights in Europe. The very worst thing that has come out of Brekfist (oops tongue tied and hungry!) Brexit, to me, has been the rise in hate crime – already we saw last year in the UK a rise in on the up, particularly Islamophobia in 2015. 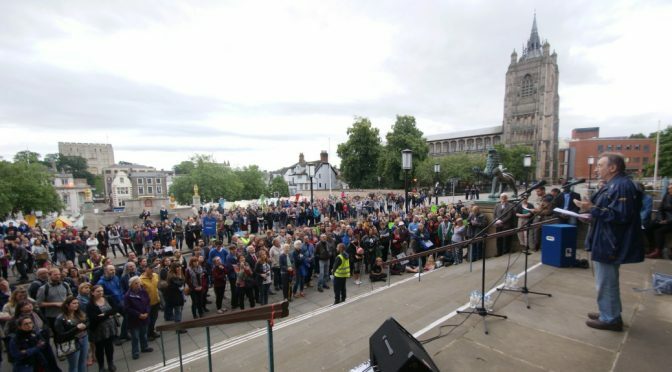 But even here in Norwich on a single day just days after the Referendum I heard of 3 local hate incidents, by the end of the weekend nearly a dozen I’d heard of, and those were just those I was connected to via social media here in Norwich. There were a hundred more elsewhere over Brexit weekend, and over 500 since, over a week it was 500% up according to the police, 66/day in London, 200+/day across the country, according to Tell Mama, over 800 per cent rise in Islamic phobic hate crime. Most go still unreported, so the situation is probably worse, many are now living in fear. Now, I don’t mean to shock you with this but one of the worst statements of what was actually casual racism as it’s called, as if there’s such a thing I saw was online, and it was locally was, and someone said: “don’t worry about the rise in racism, it will be offset by the fall in murders and rapes murderers and rapists“. 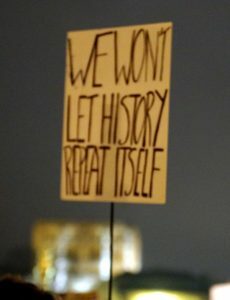 That is something we need to oppose vehemently, and that’s root and branch, and that doesn’t just mean “Oh I condemn it ” and politicians saying “I condemn it, and we’ll do more about it”, it means getting to the grassroots of culture in our country to change people’s attitude. London was a place that voted predominantly to Remain and yet has the highest immigration and has had it for the longest it is more integrated. I lived there in the 80s when it was less integrated. Places like Boston, yes they have high immigration now but it isn’t fully integrated yet and they haven’t got used to it. Some of these things take time but leaving Europe means we haven’t don’t have that time. There are things that we need to do now. The UK was actually part of a liberal bloc in the EU, and that is actually weakened by our leaving, we’re abandoning the liberal and reforming movements within Europe by leaving them without what would become a 35 per cent blocking minority on less-liberal proposals from further far right groups factions within Europe the EU. Absolute sovereignty and security – sovereignty was the biggest issue, even above immigration, in the EU campaign but absolute sovereignty and security in a global world is a myth. Geography continues to be redrawn on maps, and online daily – it doesn’t really exist at all. Instead, according to a leading British professor of EU law it’s about control and power, and they’re not even true. After Brexit we will have more apparent control but less actually less power and less influence in the world, and none at the EU table, and losing a market and community of states, that’s twice the size of America, and nearly half of our global trade. And even if we leave we will remain in the European Courts of Human Rights, we will remain in the Council of Europe, we remain in NATO, WTO, G7, G20, various international laws, human rights, maritime, and environment agreements. This is the 21st century not the 19th! We cannot peddle backwards. Democracy though is imperfect and not always right – especially, when I don’t get my own way. Ha, no! Yes, the Referendum was democracy in action, but democracy in a factless vacuum and a fatuous vacuum does not work – Hitler rose to power on democracy and then abused and crushed it in the name of national unity and self-interest. Democracy also fails when there’s evident electoral bias. My South Norfolk Polling Station had two Brexit tabloids on display next to the voting slips, if you ask me that invalidates that vote and that wasn’t Norwich I live just South – still under investigation by the Electoral Commission and local counting officer, despite reporting it halfway through voting day. Democracy doesn’t work when we are lied to by, both sides, leading to a situation where 22 per cent of people admitted they didn’t understand the facts well and yet still voted, some of those same people googled after the polls closed, “what is the EU?” 47 per cent believed the Leave campaign’s openly acknowledged “mistake” and withdrawn promise, the that of the false £350m a week EU contributions blatantly false and proven to be so. That was and electoral bribe that was withdrawn immediately. That invalidates their entire campaign it would now be spent on the NHS. The Health Service will not be getting £350m more. Furthermore, the vote will make little difference to immigration. Net budget payments to the EU will probably cost us almost the same to get some kind of Norway or Swiss deal. If the Pound remains low, inflation will already add 5-10% to food and petrol prices, affecting everyone and especially the working classes, especially the poor, especially the people who voted ‘Out’. If we ever want to rejoin, you can be assured we will never get the rebates, reforms and exemptions we got before. We actually have one of the best deals in Europe at the moment and we’re about to trash it. One of my biggest issues, is that people were not informed of the economic, social and legal facts and consequences, without falsehood or media and party bias, in order for the Vote to fairly consent to the Referendum choices, how can they consent when what they heard was not fair or true. In the most more blatant cases they were lied to by again both campaigns. Exaggeration that was what the Chilcot Report criticised Blair’s campaign to go to war over, blatant exaggeration. Fear won. It was a campaign of fear. Democracy based upon lies and fear is not democracy but deception and manipulation. That is how the National Socialists rose to power in the 1930s. My first degree was in Economics and Statistics so I know very well how to lie! The UK was 5th in the world economic tables, and was about to overtake Germany, because of the Pound’s since Brexit’s 12% currency devaluation the last two weeks, (18% off its 12 month peak) we’ve already dropped a place slipped to 6th instead, behind below France. And we will keep slipping if we do not reform Europe and the UK’s position in it. The FTSE 250 remains 8% down. But our rights of representation include the right to protest the results of any electoral or parliamentary decision, that’s what democracy is, it doesn’t mean just once every 5 years or once every 50 years which is what the EU Referendum was about. The rights to representation means we can keep complaining, it’s not sour grapes, it’s not just get on with it and accept it, or e-x-c-e-p-t it as a lot of people have been spelling over Facebook! I do agree with ‘excepting’ that decision the other spelling! But as millions have done since austerity under the Tories, or even under the war that Tony Blair took us into. People took to the streets and called for general elections, called for referenda, called to bring down governments, that is our democratic right, not to accept the decision and to keep campaigning, but to keep persuading as well, to keep proving that a majority are moving in favour of staying. Agitation to peacefully bring down a government, petition for change, is a very British revolutionary right way of doing revolution in these days. The parties are already stabbing themselves in the back. Brexit It has already brought down several seen two party leaders go and most of the Brexit pretenders. Nigel Farage himself, as you’ve already heard, says admitted that he too would have called for a second referendum had the margin 52-48% been the same in Remain’s favour. So it’s schadenfreude and hypocrisy to say that we shouldn’t be calling for it too. In the 5 days since the Referendum, Parliament received over 5,000 petitions, nearly 50 times their normal democratic load. The most famous is the call for a second Referendum if there was a narrow margin of victory. 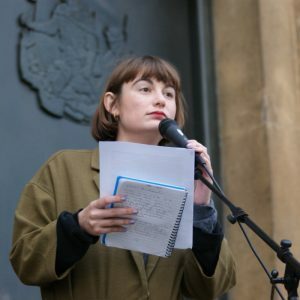 It was actually a Leaver’s petition hijacked by Remainers! It has over 4 million signatures even after removing the fraudulent ones, the fastest and largest ever in the UK. That is a demonstration of democracy, that is a demonstration of people power and a demonstration of political engagement but it is still not enough. If 80% of young people wanted to stay in and yet 80% didn’t vote, then there’s still a lack of political engagement, that’s what we’ve got to change. People power can bring down governments and/or prevent Article 50 if we can prove the electorate has changed its mind or was lied to as with the Chilcot Inquiry into the Iraq War. We can continue to call for compromise and delay, and a fresh democratic mandate to ratify or reject any Exit deal, once the facts are known. This has been suggested by Jeremy Hunt, the Health Secretary, despite being ruled out by all the Tory leadership candidates. There are legal reasons why a referendum based upon lies can be disregarded, indeed Parliament is only morally obliged to follow a referendum’s verdict, not legally. The regret vote, according to polls, is now already shifting 7-14% away from Leave, (oddly enough 3% of Remainers have shifted to Leave!). But the point is the gap has shifted in our favour. Wales is now polling as majority Remain – probably because of the football! People on Guido Fawkes website are already planning street demos and riots should there be a second referendum or non-Brexit. But it is the extremes of traditional Left-Right politics behind Brexit, nationalistic and anti-establishment views, not the centre ground of engagement with Europe. Politics is changing and it’s calling. It calls for a new politics, a the rainbow coalition and progressive alliances to defeat an insular nationalism. A majority of those under 45 voted Remain, but a majority of those under 35 didn’t vote. We need to re-engage with not only politics but voting and that engagement and education so that people’s futures are enfranchised. I think it was one of the Swiss guys this week who said that where we have failed is by abandoning investment in education over the last 2 decades. I mean with people like Gove at the helm – that is why! 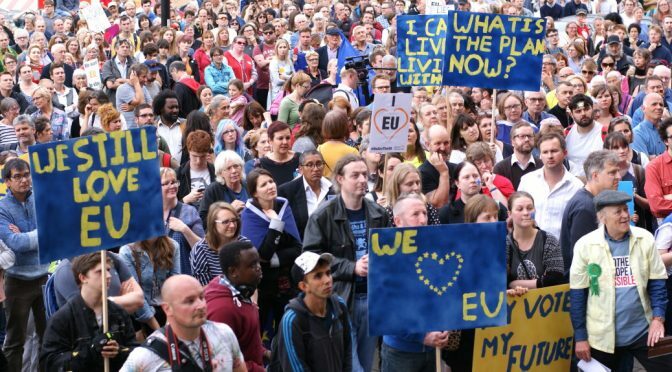 If Article 50 is delayed and a Referendum or General Election called before any final EU withdrawal attempt, by then hundreds of thousands more younger people will have gained the vote and those that didn’t vote can be mobilised. The UK and its universities receive more funding from the European Research Council than any other country and 50% more than Germany, allowing UK universities to fund more than 10% of project-based research from EU contributions. The EU has contributed to 50 years of peace and harmony in Europe, prosperity has been dented not because of the EU but because of austerity and the world economic crash of 2008, because of the banks, because of bailing them out and not bailing the poor out. Being in Europe but not a part of the Euro, has actually served British interests very well. The EU does not want us to leave, nor do Scotland, Northern Ireland, Gibraltar, London, Norwich and elsewhere, not to mention Wales and Cornwall beginning to shift. I want to remain and if we have to leave, to revote once the facts of the deal are knows, or to petition to rejoin, as soon as possible. It is not a loser’s tantrum, it’s my democratic right and yours to keep saying that I want to stay in the EU, even in opposition, but significantly it is and my moral responsibility to stand up for those in the UK who don’t have no electoral rights, no voice, like the millions of EU and other immigrant peoples who cannot vote, and the people under 18 whose futures we are gambling deciding now but the reality of which will not kick in until a time when they would have had their own a say. With 7-14% of Leavers regretting their votes and 100s of thousands being enfranchised by the time an EU deal is negotiated, we would almost certainly vote Remain at another more honest fact-driven Referendum prior to debating deals or launching any Article 50, next year – according to Theresa May. We are entirely within our rights to keep making those voices heard, as we are today. Thank you.